The Chronicle of Higher Education is reporting today that it has obtained evidence demonstrating that, contrary to claims from his family's legal representatives, former Penn State football coach Joe Paterno was in fact able to use email. And he wasn't afraid to do so in order to try and protect his football program. An email exchange between former Penn State president Graham Spanier, vice president Gary Schultz, and athletic director Tim Curley that was reported by CNN last week seemed to suggest that the university administration had decided not to report Jerry Sandusky to the proper authorities after being dissuaded by a conversation with Paterno. Paterno's family responded to CNN's report by claiming that select emails were being leaked in order to smear Paterno's name, and that Paterno himself never actually used email, meaning there was no record of him being involved in the alleged cover-up. After the incident, Mr. Paterno wrote to Graham B. Spanier, the university's president, and "Tim"—presumably Mr. Curley—through an e-mail account used by the coach's assistant, Sandi Segursky. "I want to make sure everyone understands that the discipline of the players involved will be handled by me as soon as I am comfortable that I know all the facts," said the April 7, 2007, e-mail, which was signed "Joe." Thanks for sharing. I assume he is talking about discipline relative to TEAM rules. Obviously discipline relative to the law is up to the police and the courts, and discipline relative to violations of the student code of conduct is the responsibility of Judicial Affairs. This has not always been clear with Coach Paterno so we might want to clarify that and encourage him to work with us to find the truth and handle this collaboratively with the police and the university. The challenge here is that the letter suggests that football should handle this and now Coach Paterno is also saying THEY will handle this and makes it look like the normal channels will be ignored for football players. 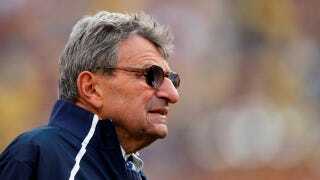 Last year, the Wall Street Journal reported that clashes between Paterno and Triponey over player discipline had led to the dean's departure in 2007—by Triponey's account, after the university president informed her that "Mr. Paterno had given him an ultimatum: Fire her, or Mr. Paterno would stop fund-raising for the school." The exchange published in the Chronicle appears to support the idea that Paterno believed his football program should be immune to normal university discipline. And he wasn't shy about flexing his muscle. Even over email.